The quality of your filing is more important than ever. XBRL®, short for Extensible Business Reporting Language, enables the standardisation of data for key stakeholders and investors. The quality of your data is critical, as is selecting the right service provider. The Workiva team provides global XBRL and Inline XBRL® consulting and tagging services. Expertise and support is available for submissions to regulators, including SEC in the United States (supporting US GAAP and IFRS Taxonomies), HMRC in the United Kingdom and CIPC in South Africa. Workiva is also able to meet the forthcoming ESMA requirement for ESEF reporting in 2020. XBRL®, iXBRL®, Inline XBRL® and Extensible Business Reporting Language® are trademarks of XBRL International, Inc. All rights reserved. The XBRL® standards are open and freely licensed by way of the XBRL International License Agreement. Streamline your tagging, and reduce the risk of errors by bringing people, data and processes together. Workiva maintains a large ongoing investment in XBRL mapping and tagging technologies. The platform incorporates an additional level of validation checks that look at the meaning of the tags used from a business and accounting perspective to help you identify errors. Manage change, revisions and validations across internal and external teams without losing time. With Workiva, you can manage updates, changes and commentary. Simplify certifications and sign-off processes. Assign and respond to tasks in your data and reports. 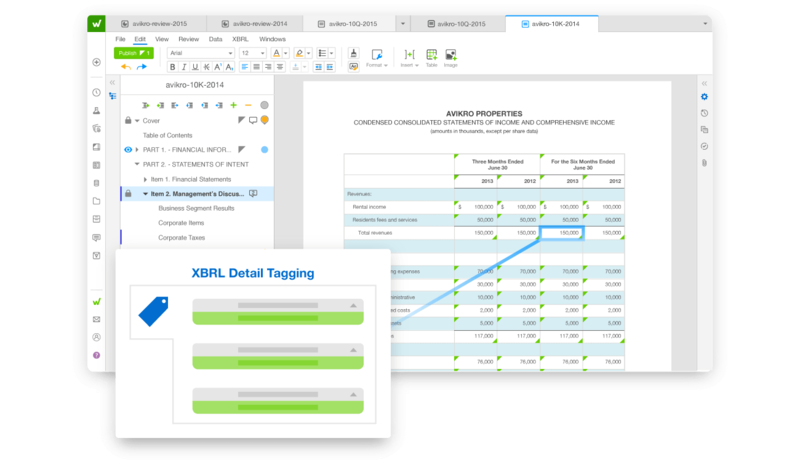 Roll documents forward to ensure XBRL and iXBRL tags are consistent with those filed in previous periods. Built-in controls ensure peace of mind. The platform allows you to monitor and restrict permissions by role or open documents for simultaneous collaboration by large teams. Leverage version control and blackline comparisons to document revisions. Employ a full history and audit trail of changes. The Workiva team has extensive background in global regulatory requirements and taxonomies. Our thought leadership team consists of some of the best-known XBRL and accounting experts in the world, including the Former Chairman of the Financial Accounting Standards Board, Former SEC Deputy Chief Accountant for Policy and the current XBRL International Best Practices Board member and Task Force Chair.